Leading up to "The Swimming Cities of the Ocean of Blood" Ganges River project we produced a series of elaborate, themed events. For these events I developed themes and concepts, built props and costumes, organized performers and acted as a general manager. 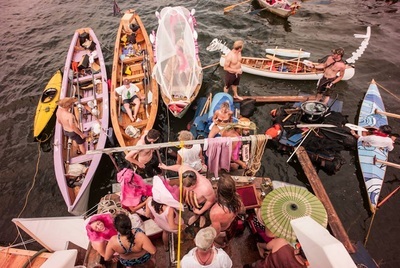 is an annual flotilla event that emerged as a spinoff of the Swimming Cities projects, due to its increased popularity it now has its own life. 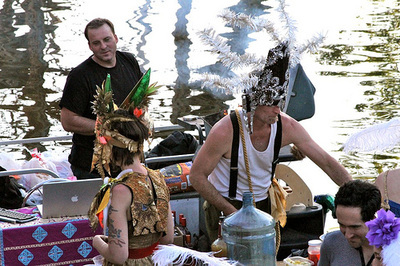 Artists are invited to form costumed tribes to compete in "gladiator combat" and DIY boat building. 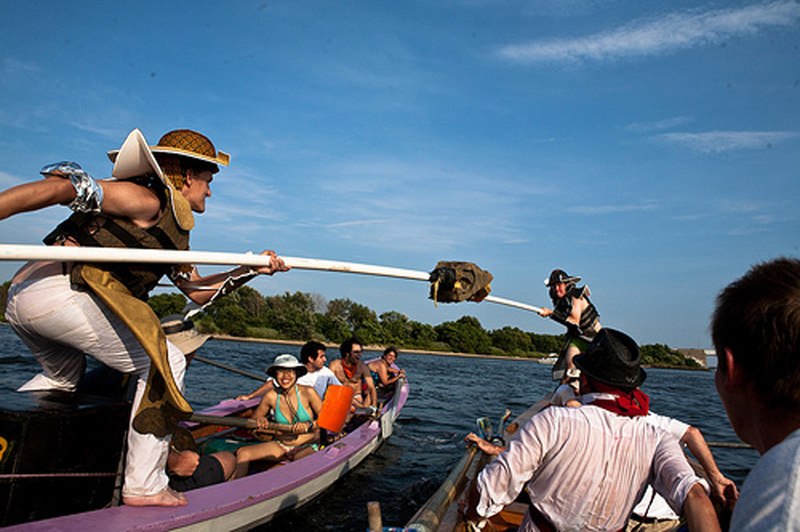 We promote the use of public waterways and create a space for waterborne art and culture in New York City. 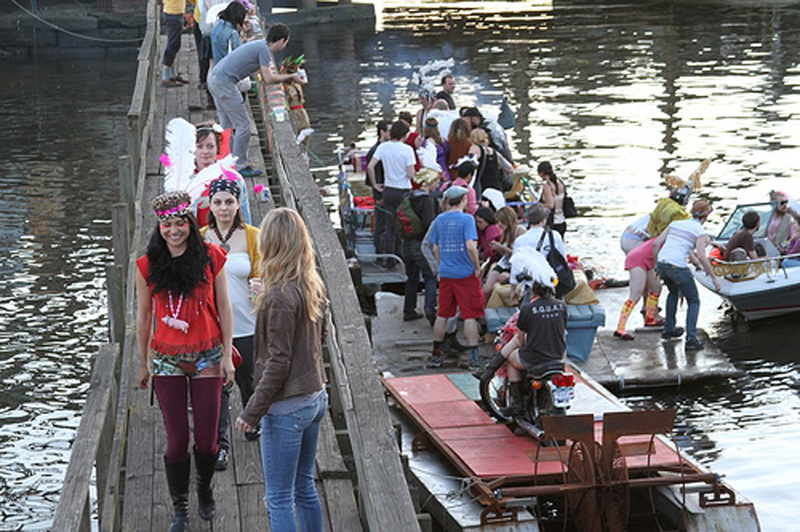 was a large event we held in a former trolly repair garage in Bed-Stuy, NYC. The space was fashioned as a border between two very different fictional countries, "Takistan," an absurd and opulent monarchy and "Vulgaria," a raucous and corrupt eastern block state between which we erected a fifteen foot wall. Tackistan offered a casino, Princess cupcakes S'n'M boudoir and a royal wedding that elaborately married two members of the crowd from either sides of the wall. 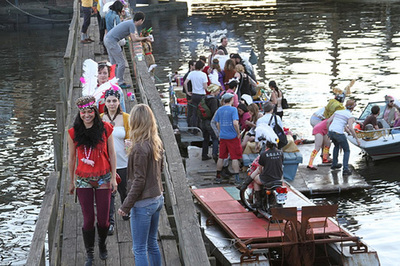 People entered this event at two separate doors and travel between the countries was made impossible without completing a series of fun, ridiculous tasks or bribing the trash collector to smuggle you in his trash cart. Towards the peak of the evening, agents and rabble-rousers were planted to spread sentiment of revolution and as the crescendo, the crowd destroyed the border with their bare hands to reunite and dance on the rubble of the wall. was a flotilla event themed on New York's West Indian Day Parade with Dance-hall music, jerked chicken and carnival costumes. 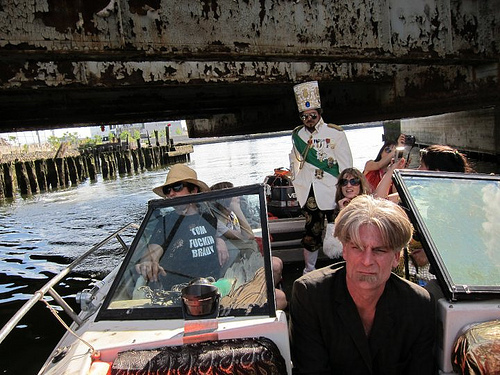 We ferried guests by boat from a pickup point to a secret hidden location in Newtown Creek, Queens, NYC. 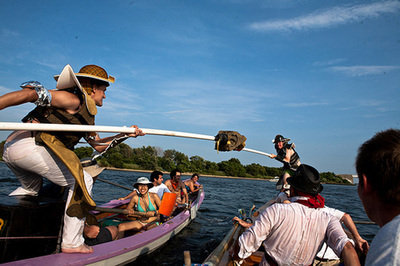 For the World Maker Fair in New York we presented the "RADIAL" our five boat formation for the India project with several attractions including a hot dog gun shooting gallery, a screen printing workshop and an "apothecary." 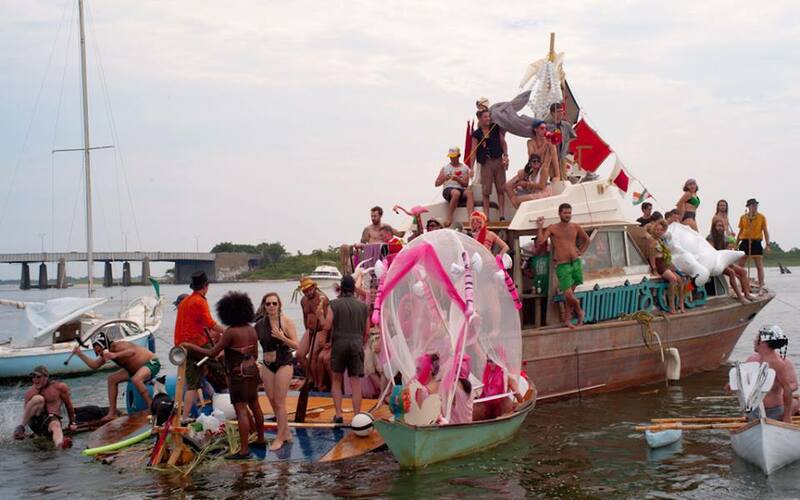 We also entered one of our pontoon boats into the Madagascar Institute's "Chariot race," affixed to its trailer, pushed by a motorcycle and adorned with a giant maniacal fish sculpture .